Estació de França or Estación de Francia (France Station) is a magic place for architecture enthusiasts. As seen from La Ribera quarter on the other side of Marques De L'Argentera avenue the place looks rather dull and does not give you any clue of the beauty inside. The moment you walk under its gates the light coming through the stained glass both in the domes and walls gently falls on the polished marble floors creating this mysterious soothing church-like atmosphere quite pleasant if you are about to travel. In fact, I felt like skating across the hall in the way a child would do. The elaborate modernist and art deco motifs and specially those metal spheres hanging from a sort of ring tied to the domes are a pleasure to the eye. 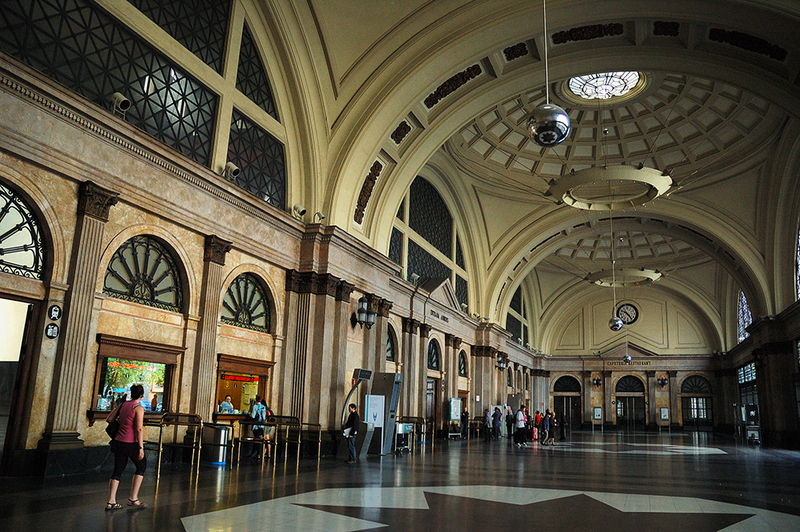 Although the railway station has been there since 19th century the building was rebuilt in 1929 for the International Exhibition by renown Spanish architect Pedro Muguruza who held important positions in Francisco Franco's dictatorial government but that's part of another story. Soon (not necessarily tomorrow) I will post some details of the ceiling and the train platforms. Check La Ribera quarter and Estació de França on Google maps. Gorgeous photo. I have looked through your blog and you capture Barcelona beautifully!